Lightweight tear-away stabilizer (top) and heavy cut-away (bottom). Like the foundation of your home, stabilizers support the stitches you place upon them. If the foundation is not good, the structure isn't either. With all of these different weights of stabilizers, which do you use? 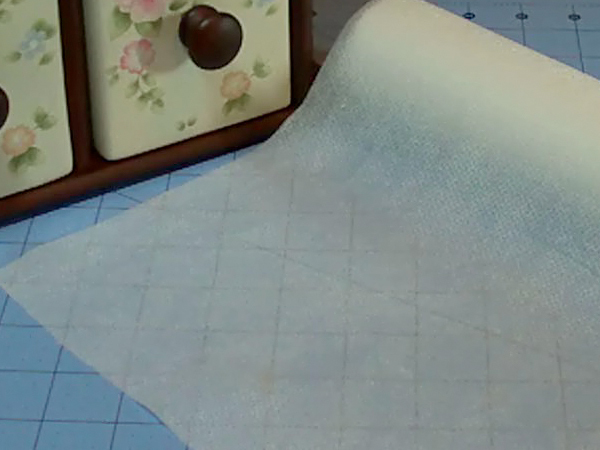 In the early days of machine embroidery, stabilizers were scarce and many tried alternatives like coffee filters, dryer sheets, and even muslin. Today, there are dozens of choices, which is good except that it may seem like there are too many from which to choose. And they are costly (unless you are an Ann's Club member, then they are half-price!) so you don't want to buy stabilizers you don't really need. Here are some guidelines for choosing the proper tear-away or cut-away stabilizers. Lightweight tear-away stabilizers are semi-opaque. Some, like this one, almost resemble waxed paper. For light stitch designs on light or medium weight, like outline stitching or redwork and heirloom stitching with a wing needle, lightweight tear-away stabilizers work well. Back of lightweight tear-away stabilizer. Just peel the stabilizer away from the stitches. Lightweight tear-away stabilizers are even good as a topper and guide for quilting. 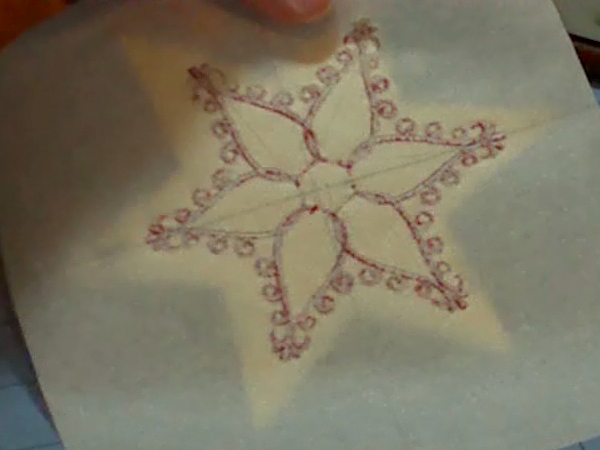 Trace your quilting design on the surface of the stabilizer (or cut it into 8.5" by 11" sheets and copy or print the design with your printer). Pin it, lightly iron, or adhere it with temporary spray adhesive to the surface of the item to be embroidered and stitch along the lines. It should easily tear away. Any small pieces remaining in the stitches usually wash out in the laundry. A good, general all-around choice for machine embroidery on stable fabrics is a medium-weight tear-away stabilizer. 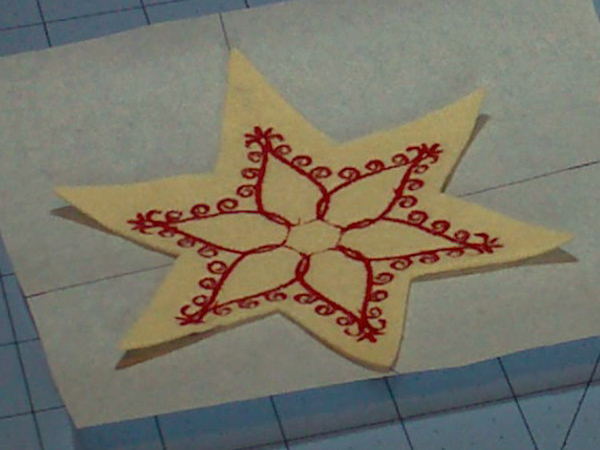 They work well for designs that consist mostly of fill stitching as well as applique satin stitching and even buttonholes (that is where saving and marking stabilizer scraps is helpful!). Some are available as an iron-on no-show mesh. These are good for lighter weight fabrics where the stabilizer may show through or the stabilizer would be so stiff it would look out of place behind the embroidery. Some iron-on stabilizers must be left on the fabric. Others tear away after stitching is completed. It depends on the finished item which of these will work best for you. If the item you are stabilizing is purely decorative and the stabilizer won't show, it doesn't hurt to leave it in. Otherwise, it can be carefully torn away after stitching is complete. Even heavy tear-away stabilizers perform beautifully with woven fabrics, providing a stiff base that can be torn away following stitching. A general rule of thumb is that the tear-away stabilizer isn't too heavy if it is undetectable from the front of the embroidery. If you can see lumps and bumps, it's too heavy. If you can see puckering, it isn't heavy enough. Cut-away stabilizers are often used with heavy satin-stitched fonts to prevent puckering. Trim close to the stitching. Cut-away stabilizers stay attached to the embroidered item and are trimmed close to the embroidery. If remaining stabilizer is in a place where it will be in direct contact with skin, it may cause irritation. Ironing a piece of fusible mesh over the embroidery and stabilizer edges on the back of the embroidery will create a soft barrier, which is particularly beneficial in infant and toddler clothing. No-show mesh stabilizer. Some are temporarily fusible to the base fabric. When delicate fabrics need heavier stabilization, a mesh cut-away stabilizer helps to soften the base upon which threads are stitched so it doesn't show through the fabric as readily. 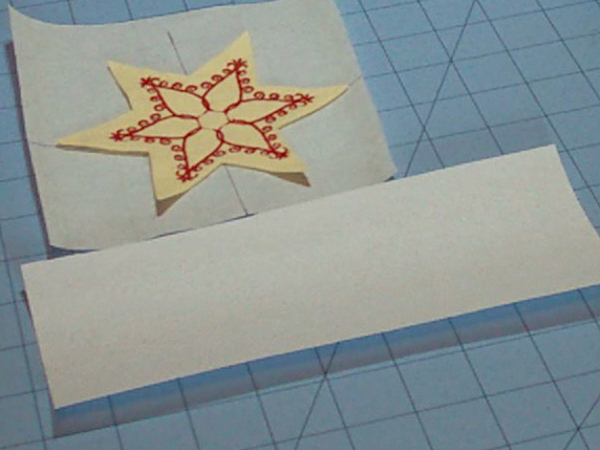 Needle perforation of stabilizers usually means you need a heavier stabilizer. 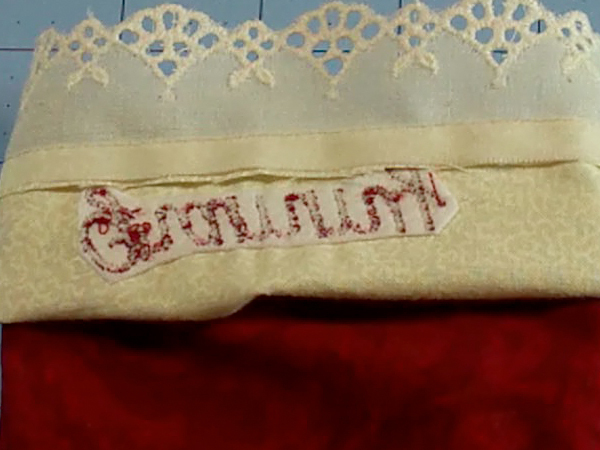 Leave-in stabilizer thickness needs to be taken into consideration when using with applique or quilting as multiple layers of cloth, batting, and/or stabilizer can add density to the item you are embroidering. In these instances, often a tear-away stabilizer is best. It can be torn away to avoid bulk but still supports the stitching. If you don't' have the necessary weight, tear-away stabilizers can be layered. Carefully tear one layer of stabilizer away at a time to prevent distortion of embroidery stitches. You may also find it useful to hoop a tear-away or adhesive stabilizer and float a piece of cut-away under the hoop while stitching. Always conduct a test sew with the same fabric or (if it is a garment or purchased piece) a similar fabric before stitching the actual piece. Results will vary by embroidery machine, embroidery design, thread used, and stabilizer used. It's just one more reason an embroidery journal is helpful in finding out what works for you!